Discuss Game of Thrones here. Cant miss that. I love Diana. She's in Dr Who as well. Talent means you never stop working. Best actress ever to play a Bond girl? That's awesome. I love the series and Diana too. Nice to see she's still getting work, really good actress. btw, is Game Of Thrones any good? I know Sean Bean was in it for a bit so I thought of checking it out but never really bothered. I was enjoying myself when I watched it. I caught the first few episodes of it when it originally aired - Sean Bean was great, along with the rest of the cast - but I had to return home for Christmas break and didn't catch up on the rest of the season, along with the second (and upcoming third) seasons. From what I saw, though, I would recommend it. It's great to see her get this role off the back of Doctor Who! Good show from Rigg. I hope work keeps coming her way. She, along with Jane Seymour and Kim Bassinger, seem to have had the best careers after being a Bond girl. And before as well! Let's not forget her excellent work as Emma Peel on "The Avengers." Very true, a great talent a my favorite Bond girl. That's the first thing that interests me in Game Of Thrones. I might give it a try... But then again I might not. I'll think about it when her episodes come out. I heard someone asking if GOT is worth watching? I would say without any hesitation yes it is, I've read all the books and have been very impressed the way RR Martin's books have been realised, the acting the storytelling and the production is top notch, I believe it is now the most expensive TV series of all time and it's all up on the screen. 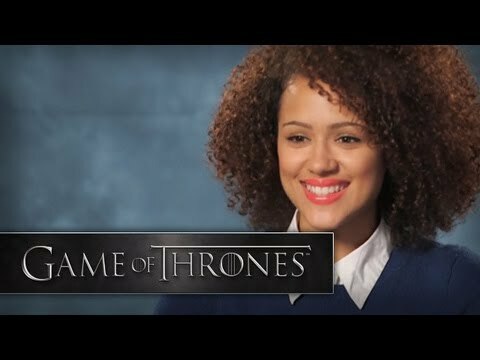 As for the casting, I don't think a TV series has been cast better and Rigg's introduction to the call sheet is another example of the high standard that is exhibited by HBO. Don't be put off by the fantasy element, this is less LOTR and more Soprano's and the Godfather and it's most definitely an adult experience with no Knight is shinning armour element at all, check it out. The only reason I refuse to watch this series, is soon they're going to hit a brick wall when they run out of books. When the series is nearly complete though, I'll watch it. The next book is being split over 2 series and the next 2 will probably need about 3 to be honest, Martin's a good way into the next book and as long as he doesn't pop his clogs I can't see him not completing his series so we've got a good 5-6 years of seasons to go so I can't imagine any brick walls been hit unless GRRM drops dead of course. I hope that's the case but I'll wait to see where we are in a few years first. So...Season 3 just ended. To me, that finale was pretty poor compared to last two seasons. Then again, how do you possibly top what happened last week? What are your guys' faults? Jamie and Ceresi got back together way too early...what happens now when she's crying over Joffery's body? I haven't seen any of season 3 yet, but I've been trying to follow it anyway, via reports. I'lll watch it all on dvd when it comes out. ...certainly got people talking. Great cast, great acting, great surprises- I can't get enough of this show. I get the feeling it would be better to wait until this series is over before watching it, myself. I love GOT, but have been a little lax and haven't watched the last 2 episodes of Season 3 yet. On my DVR and will be caught up this week. Based on what I've seen thus far, I thought the first 2 seasons were better. Was that Geoffrey Wright I saw in coming previews? Damn, that could be awesome and should be, Wright is fantastic as Leiter and should have even more "meat to chew" here. I can wait five years! Not even! The creator has written 5 out of 7 books...and the sixth one is only about 2/3 completed as of right now! Oh, you're in for a treat. No spoilers. Not at all. The series will be finished by 2018, so the ending will be seen on TV first. My favorite TV show since Lost. Has anyone been keeping up with this show? If so, what did you think of last week's episode? Yes, I have. Great episode. Diana Rigg plays a fascinating character.